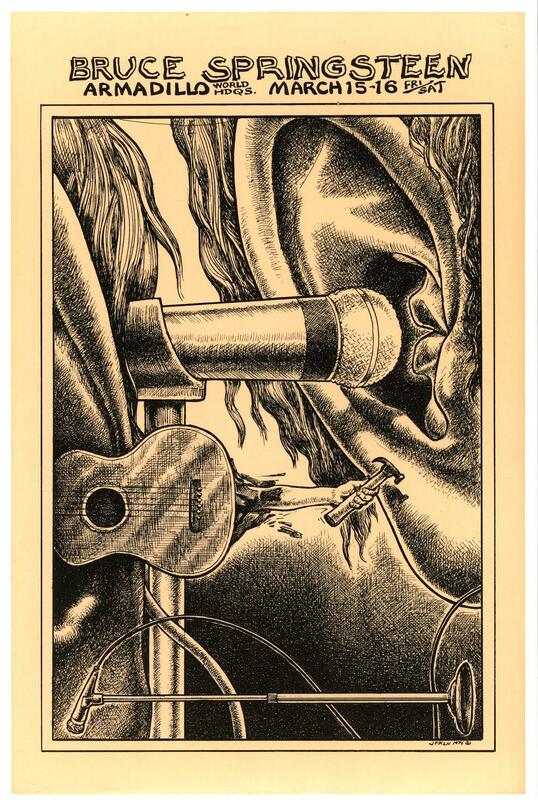 Austin music history: Music posters from the 1960s and 1970s. 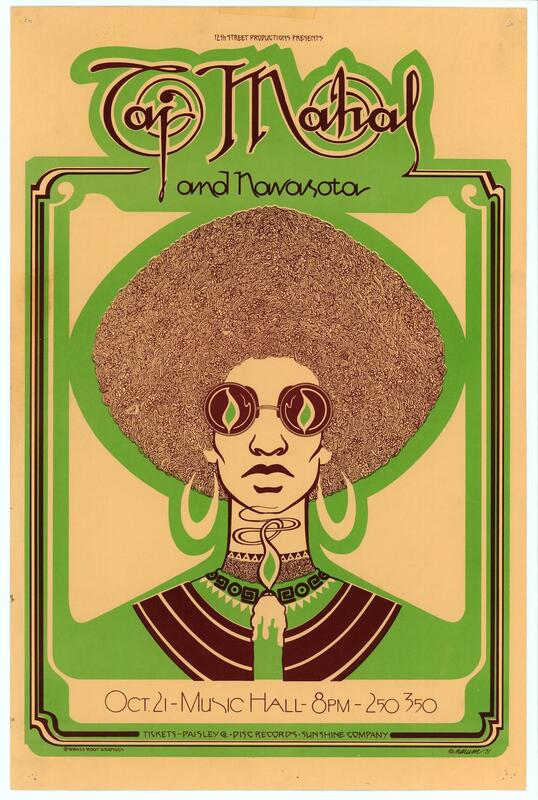 A new book collects music posters printed in Austin, Texas, between 1967 and 1982, as the city’s music and underground art scenes flourished. 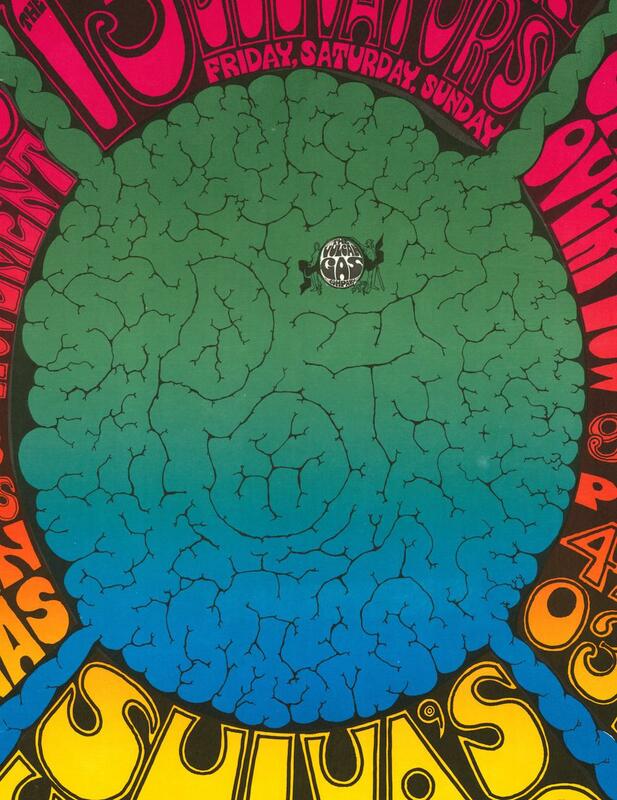 Homegrown: Austin Music Posters 1967 to 1982 tracks the shifting aesthetics of Texan poster artists responding to psychedelia, rock, and punk. 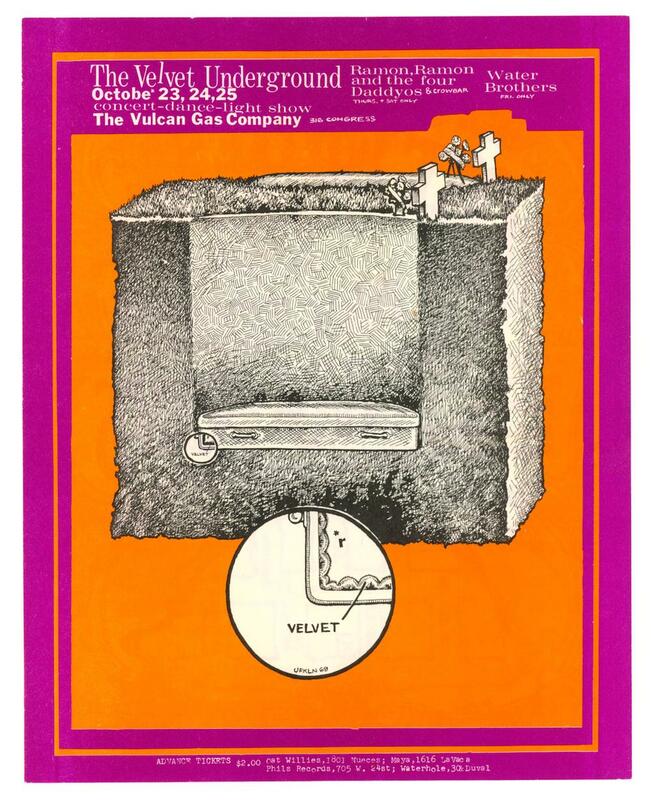 The Austin poster scene of the late 1960s was helped along by the patronage of the Vulcan Gas Company music club, which booked rock and psychedelic acts. 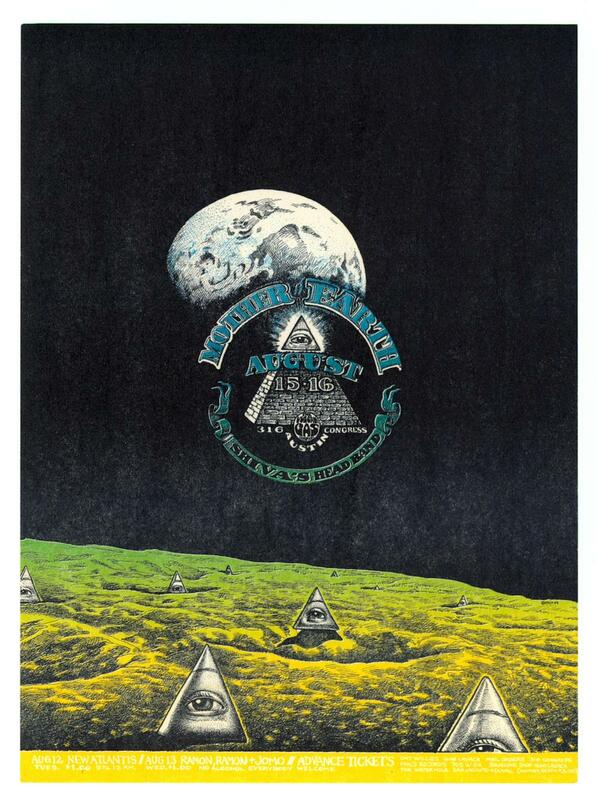 Over the two-and-a-half years that the club operated, a series of designers—Gilbert Shelton, Jim Franklin, others—produced posters for visiting acts. They drew quickly, sometimes producing a poster in a night. Many also drew comic books. The opening of the Armadillo World Headquarters club in 1970 offered employment to poster artists left in the cold after Vulcan closed earlier that year, and, writes Jacobson, artists “began to exhibit a piquant, uniquely Texas flavor,” departing from the tripped-out San Francisco style and evolving a satirical point of view. 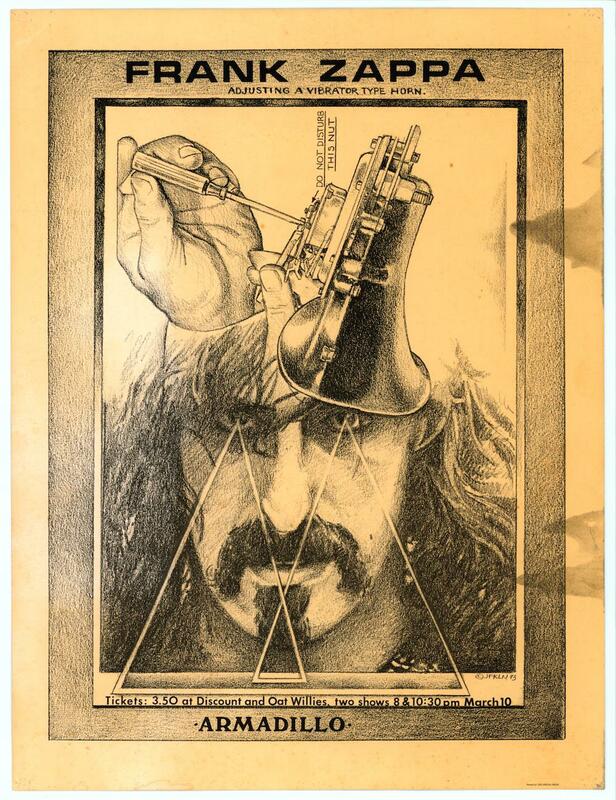 “Production costs were kept to a minimum by forgoing halftones in favor of crosshatching and stippling,” as in Jim Franklin’s Springsteen and Zappa posters below. GILBERT SHELTON. The 13th Floor Elevators, The Swiss Movement, The South Canadian Overflow, & Shiva’s Headband. Vulcan Gas Company. Dec. 8–10, 1967. © Gilbert Shelton. Posters from Homegrown: Austin Music Posters 1967 to 1982 (Copyright © University of Texas Press) used by permission of Gilbert Shelton. For more information visit www.utexaspress.com. JIM FRANKLIN. New Atlantis. Aug. 12, 1969. Ramon, Ramon & Jomo. Aug. 13, 1969. Mother Earth & Shiva’s Headband. August 15 & 16, 1969. Vulcan Gas Company. © Jim Franklin. 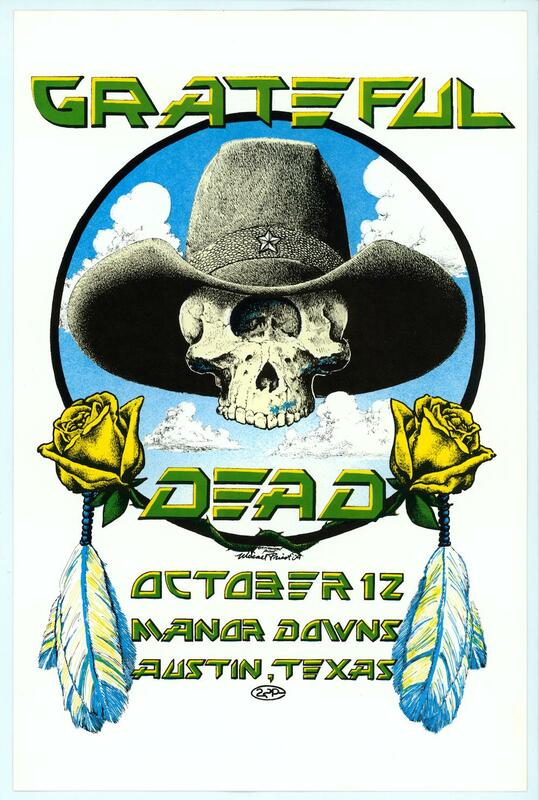 Posters from Homegrown: Austin Music Posters 1967 to 1982 (Copyright © University of Texas Press) used by permission of Jim Franklin. For more information visit www.utexaspress.com. JIM FRANKLIN. The Velvet Underground, Ramon, Ramon and the Four Daddyos, Crowbar, & Water Brothers. Vulcan Gas Company. Oct. 23–25, 1969. © Jim Franklin. BILL NARUM. Taj Mahal & Navasota. Music Hall, Houston. Oct. 21, 1971. © Bill Narum. Posters from Homegrown: Austin Music Posters 1967 to 1982 (Copyright © University of Texas Press) used by permission of Bill Narum. For more information visit www.utexaspress.com. JIM FRANKLIN. Frank Zappa. Armadillo World Headquarters. March 10, 1973. © Jim Franklin. JIM FRANKLIN. Bruce Springsteen. Armadillo World Headquarters. March 15 & 16, 1974. © Jim Franklin. MICAEL PRIEST. Grateful Dead. Manor Downs. Oct. 12, 1977. © Micael Priest. Posters from Homegrown: Austin Music Posters 1967 to 1982 (Copyright © University of Texas Press) used by permission of Micael Priest. For more information visit www.utexaspress.com. DANNY GARRETT. 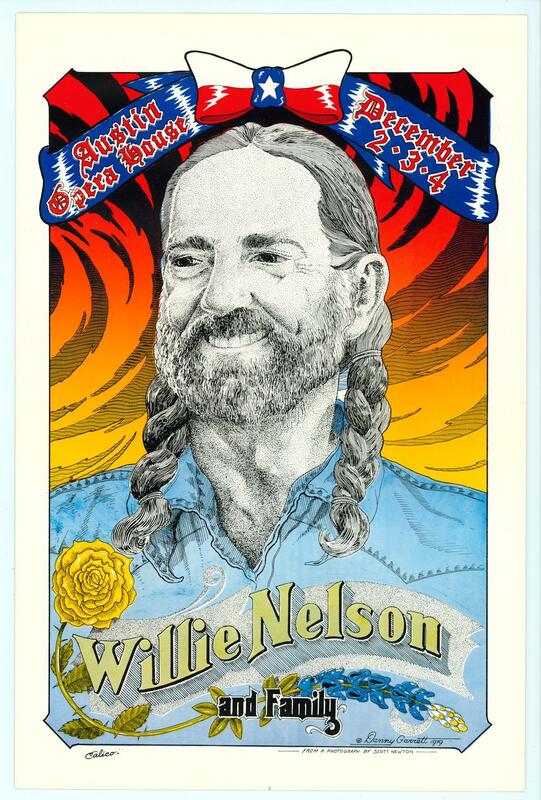 Willie Nelson. Austin Opera House. Dec. 2–4, 1979. © Danny Garrett. Posters from Homegrown: Austin Music Posters 1967 to 1982 (Copyright © University of Texas Press) used by permission of Danny Garrett. For more information visit www.utexaspress.com.